← Removing Pine Tree Sap from Clothing with Rubbing Alcohol Review – Does it Work? Natural Silver Polish with Baking Soda and Aluminum Foil Review – Does it Work? The holiday season often bring lots of company, and folks get out their best china and silver to serve the guests. 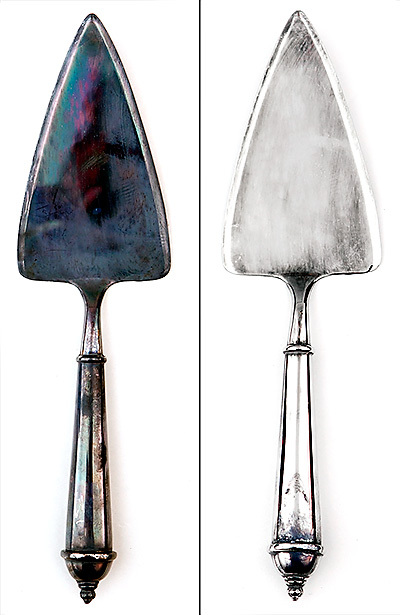 If you are blessed to have real silver cutlery or serving items, you are likely facing the unpleasant task of removing the tarnish. Silver tarnish is caused by a chemical reaction between the elemental silver and hydrogen sulfide in the atmosphere. Many silver polishes on the market can remove this sulfer build-up, but are full of toxic chemicals and come with many dire warnings about the bad things that could happen due to contact with the polish. A more natural way to clean silver is to reverse the chemical reaction with baking soda, aluminum, and hot water. But does it actually work? Saves Time – the tarnish is removed by soaking, instead of you polishing every square inch by hand – a big bonus when unexpected company arrives! Easy – boil water, and dunk – can’t get much simpler than that! I don’t have a lot of fancy things. Some “nice” dishes with a pretty pattern (but still from Target). Some “nice” silverware, that is only slightly more dainty than our everyday cutlery. A carnival glass bowl inherited from my late grandmother. And the fancy winner: a silver cake serving set that was given to us as a wedding gift from my Granny. Of course, I’m so not fancy that I didn’t even realize it was silver until I opened it a few years later and saw it had tarnished. I’ll be honest: that tarnish scared me a little. Not in an “I’m so scared!” kind of way, but more of an intimidated, “what occasion could be so nice that I would polish the silver?” kind of way. Then I turned green and crunchy and didn’t want that toxic polish anywhere near anything that touches food. Line a glass dish with aluminum foil. Place the silver in the dish, contacting as much of the foil as possible (you can see in the photo above that I made a little aluminum handle rest so the handle was touching aluminum and the server portion was flat against the foil as well). Be awed and amazed that IT ACTUALLY WORKS!! As you can see above, the method didn’t give perfect results the first time. However, this was a very badly tarnished piece (I haven’t used it once in the ten years since my wedding). When I tried it again with fresh aluminum, and fresh water, it shined up perfectly! Now I have NO excuses for not using it anytime I feel like making the day a party! Overall, this all natural, non-toxic, silver polishing method worked wonderfully to take the tarnish off the silver. It was a little stinky as the sulfur was released, and I had to do it twice for it to get all the tarnish off. However, my silver was really bad, and I’m sure with a longer first soak it would have probably been fine the first time. Also, in the future, I plan to use this serving set much more often, so a quick soak and polish are all it takes to keep them looking great! Have you ever tried this trick for polishing your silver? What do you usually do to shine up those special pieces? This entry was posted in Baking Soda to the Rescue, Cleaning, Green Holiday Ideas and tagged aluminum foil, baking soda, better for the earth, better for you, cleaning, easy, saves money, saves time. Bookmark the permalink. 24 Responses to Natural Silver Polish with Baking Soda and Aluminum Foil Review – Does it Work? Well that’s so much easier than polishing it all! Interesting. We own to sets of silver silverware. One vintage set my mom gave us for our wedding that we eat off of everyday and then when my husband’s grandparents moved to a nursing home his grand mother insisted we take her set of silver. We tried to give it to other grandchildren but they all ready had their own silverware too. So we have two sets and both are in various stages of tarnish. The set we use every day stays pretty nice although the tines on the forks seem to discolor quickly. I have used a jewelry polishing cloth in the past to clean them up. The cloth works like an emery to scrub off any oxidation. I haven’t tried this method. Isn’t there one that does bakingsoda instead of salt? I also have a friend whose mother would put the silver in leftover pickle brine. I’ve tried that and not had much success although it would be basically salty vinegar water. Perhaps I just needed to put some aluminum foil in there with it. Great post. I can’t wait to try it. I would love it if you would add it to this weeks Wednesday’s Adorned From Above Link Party. I love silver and I HATE polishing! I can’t wait to try this, I have several pieces that I have to polish regularly, so this will be a welcome experiment! Thanks! I have an elaborate candelabra set that I inherited. I line the bottom of my kitchen sink with balled up aluminum foil, add the silver, sprinkle with baking soda and add hot water. It always comes out looking like brand new. Cleaning it was one of my jobs as a child and I remember it took hours. Hi Victoria, I’m Anne from Life on the Funny Farm (http://annesfunnyfarm.blogspot.com), and I’m visiting from Natural Living Monday. I love the way you broke this down into the pros and cons, and showed the before and after pictures. Very helpful! I’m so glad you posted this! I was just debating if I was going to try this method or get out the stinky stuff. Be aware, though that this is not recommended by many people for heirloom silver or for good silver jewellery. I have been told that this process removes more silver than traditional polishing. If silver has a heirloom finish rather than a bright shiny finish, this should also not be used. Additionally any silver jewelery, such as Southwestern jewelery, that has areas of shiny silver, and contrasting dark areas should be used with this method because the dark areas are created by tarnish and the looks of the piece will be ruined, and you will probably never get it to look right again. Also never use this method with any jewelery that is made of silver and another metal unless you are sure the other metal will not be discolored by this process. Good points. Thanks for sharing your thoughts, Kelly! I’m a professional silver restoration, conservation, and preservationist. 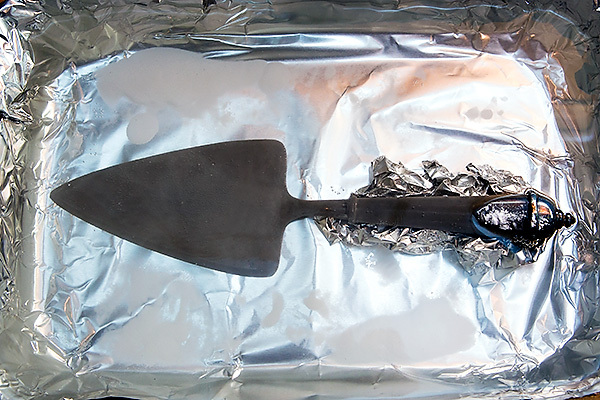 This process, known as electrochemical (galvanic) reduction, uses aluminum foil or an aluminum/ aluminum alloy plate and a warm solution of sodium carbonate (washing soda). When the object comes into contact with the plate in the solution, it removes only light tarnish, not the thick, black tarnish produced by years of neglect. Pitting of the object can occur if the aluminum plate is not periodically cleaned. Another not-so-obvious problem is scratching of the object when in contact with the plate. Objects cleaned by this method may tarnish more quickly than silver that has been polished, for the object’s surface will act like a sponge and more readily absorb tarnish-producing gases and moisture. The solution can also seep into hollow areas such as coffeepot handles, unsoldered spun beads around the tops of lightweight holloware, weighted pieces with minute holes, and any porous attachments. For these reasons, this cleaning technique is not recommended. The most thoroughly researched, and practiced silver care information. An excellent, non-toxic polish is this one: . It’s one of the most gentle polishes on the market. Just tried this today with all of my silver jewelry. I am quite amazed!!! Pieces that I hadn’t been able to clean with a cloth completely now sparkle!! Had to make several batches as my silver “habit” is quite large. Every time each and every piece turned out great! So glad I found this, thanks! I use this method, but I’ve found that using Washing Soda instead of baking soda works better, and I don’t have any ‘stinky sulfur smell’ at all. I only need to soak the pieces for a few minutes each time, then I rinse them in clean water and dry them with a clean soft cloth. Much better than silver polish! I have personally tried this baking soda solution to work on my antique jewellery but I added salt according to another source I found on the net. I agree that if it is badly tarnished, you would have to repeat the steps more than once. However, if it still does have that glitz, then once would usually suffice. Baking soda is a great cleaner. It is really a miracle. I cleaned my grandma`s silverware with baking soda for less than an hour. I was sooooo surprised. Thank you for sharing this great post! Greetings! I hate using harsh chemicals when cleaning my silverware, this article provides a great resource for collectors like myself who want to use a more natural polish to keep their silver in tip top condition, thank you.